Swiss-Made wristwatches are certainly in a league of their own. This prestigious and highly esteemed designation only appears on the dials and case backs of fine timepieces that are actually produced in Switzerland, where many of the leading watchmakers in the world have their headquarters and production facilities. A wristwatch can only be branded as Swiss-made if the movement inside, being mechanical, automatic or quartz is exclusively produced in Switzerland. This Swiss-made movement has to be encased entirely in Switzerland…and the final inspection for this watch must be completed in Switzerland by the manufacturer. Numerous watchmakers feature Swiss-made movements in their timepiece collections, however the movements are only produced and inspected in Switzerland. The remaining production of these timepieces is assembled and completed in countries outside of Switzerland. Premium Swiss-made timepieces are highlighted this week at luxury retailer TheWatchery.com with the site’s Swiss-Made Excellence Event, featuring highly sought-after Swiss-made men’s and women’s styles from Breitling, Raymond Weil, Bulova Accu-Swiss, Luminox, Maurice Lacroix, Swiss Legend, Hamilton, Gucci, Invicta, TechnoMarine & more. The Maurice Lacroix Masterpiece Automatic timepiece is an exemplary Swiss-made watch choice. Impressive in design and craftsmanship, the perfectly round case in premium-grade stainless steel is highly polished to a mirror-bright glow. The genuine black crocodile strap with a convenient deployment clasp buckle adds to the classically elegant design. 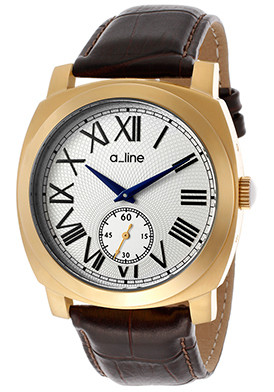 The silver-colored dial with a textured center background features a 12-hour sub-dial above the 6 o’clock hour, an automatic date calendar, gold tone sword hands and Roman numeral hour markers. An exhibition skeleton case back lets you see the intricate automatic movement inside. Features include a sapphire crystal above the dial and water-resistance to 50 meters. Maurice Lacroix watch is 40mm in diameter and 12mm thick. 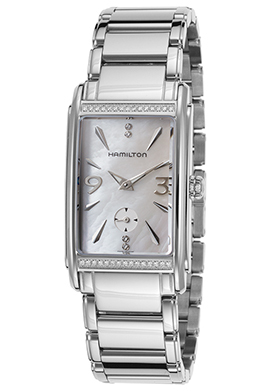 The Hamilton Ardmore Diamond watch is a splendid Swiss-made timepiece for women. Beset with radiance and glamour, this dazzling women’s dress watch features the elongated rectangular-shaped case in polished stainless steel presented on a lustrous horizontal link bracelet in stainless steel. Thirty-four top-quality, round-cut Wesselton diamonds pave-set to perfection, weave intrigue on the top and bottom sides of the bezel. 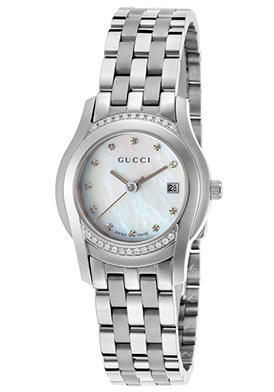 The iridescent Mother-of-Pearl dial shines with four diamond hour markers, polished silver-tone hands and hour markers. Features include a sapphire crystal above the dial, premium quartz movement inside and water-resistance to 30 meters. Ladies’ dress watch is 24mm wide and 8mm thick. 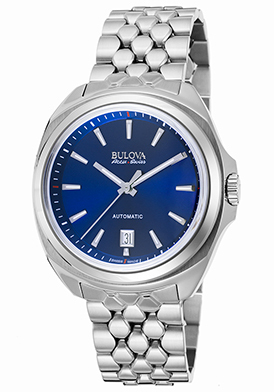 You don’t have to look any further than the Bulova Accu-Swiss Telc men’s watch for an automatic Swiss-made timepiece priced under $500. This outstanding men’s watch has a rounded-square shaped case in polished stainless steel presented on an intricate multi-link bracelet in polished stainless steel with a convenient push-button clasp. The stationary polished steel bezel encircles the vibrant blue sunray dial with luminous baton hands and hour markers. A window at the 6 o’clock hour reveals the automatic date calendar. Features include a scratch-resistant sapphire crystal above the dial and water resistance to 30 meters or 100 feet. Automatic men’s watch is 42mm wide and 12mm thick. 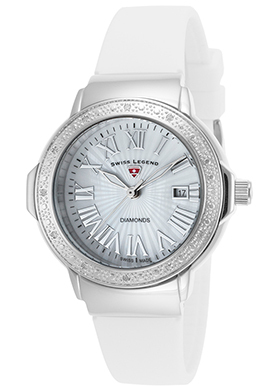 The Swiss Legend Blue Genève women’s watch is an exceptional look and value. 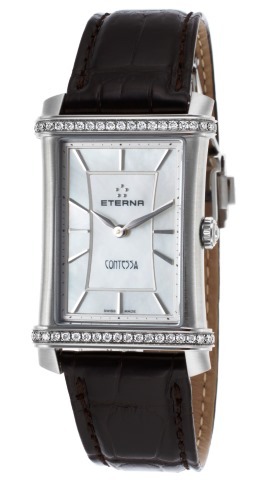 This contemporary women’s watch shines with understated elegance. 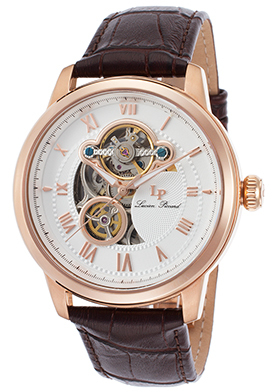 The rose gold-tone stainless steel case is highly polished to a lustrous glow. The matching triple-link bracelet is rose gold-tone stainless steel has a push-button clasp for added convenience. The stationary twelve-sided dodecagon-shaped bezel with white ceramic center ring encircles the multi-layered dial with a Mother-of-Pearl outer dial, textured center dial, rose gold tone luminous hands and hour markers. Features include a date window at the 3 o’clock hour, locking screw-down crown and case back for water-resistance to 200 meters. 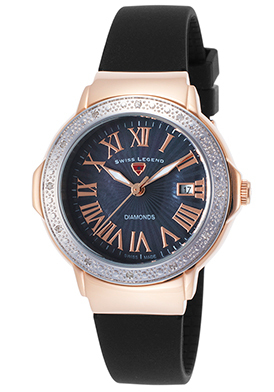 Women’s watch is 42mm in diameter, 12mm thick and features quality quartz movement inside. Today is May 2nd and summer kicks off shortly in just a few weeks on Memorial Day, Monday May 30th. For many of us the summer season is all about warmer weather, longer days… weekends by the pool or sea and lots of outdoor recreation, not to mention vacation getaways and retreats. A new wardrobe for the summer season is also essential. Whether you’re traveling across the town, throughout the country or around the globe, you’ll certainly want new fashions and accessories to wear this season. The Watchery.com makes it easy to find a new watch for the forthcoming season this week with our May New Arrivals Event, featuring over 150 timepieces from today’s leading watchmakers, including Zenith, Corum, Rado, IWC, Breitling, Maurice Lacroix, Raymond Weil, Victorinox Swiss Army, Techno Marine, Lucien Piccard, Citizen, Seiko and Swiss Legend. 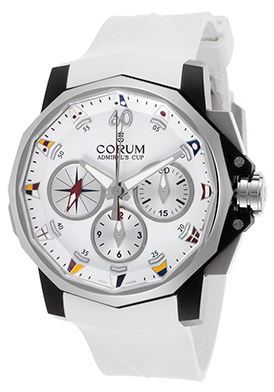 With a bright white dial and attractive white rubber strap, the Corum Admiral’s Cup Automatic Chronograph is an outstanding selection wherever your summer adventures may take you. The signature black ion-plated stainless steel case in a contrasting brushed and polished finish is presented on the durable and appealing white rubber strap. The signature twelve-sided dodecagon bezel in brushed stainless steel surrounds the striking white dial with three sub-dials, luminous hands and maritime flag decal hour markers. Features include a small-second, 30-minute and 12-hour registers. A left-sided push-piece activates the split-second counter. An exhibition case back lets you see the intricate Swiss-made automatic movement inside. Additional features include a scratch-resistant sapphire crystal above the dial along with a screw-down crown and case back for water-resistance to 100 meters. Corum watch is 44mm in diameter and 16mm thick. 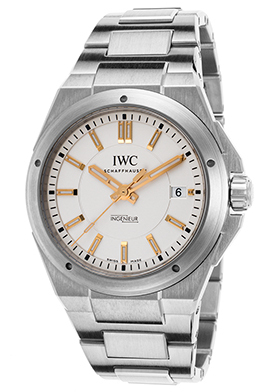 The IWC Igenieur Automatic timepiece is an excellent sport watch choice. This premium Swiss-made watch features the handsome 40mm diameter Tonneau shaped case in premium-grade stainless steel with a satiny brushed finish. The matching brushed steel triple link bracelet has a convenient push-button fold-over clasp. The stationary brushed steel bezel surrounds the white dial with rose gold-tone hands and hour markers. A window at the 3 o’clock hour reveals the automatic date calendar. Features include a locking screw-down crown and case back for water-resistance to 120 meters and a scratch-resistant sapphire crystal above the dial. 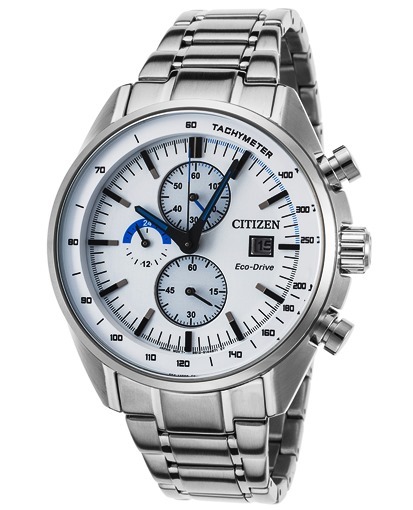 The Citizen HTM Eco-Drive chronograph is a more moderate sport watch style. This outstanding men’s timepiece features a rugged, masculine 44mm diameter case in brushed stainless steel and a brushed and polished stainless steel multi-link bracelet. The bright white dial has a tachymeter outer dial, three sub-dials, blue sword hands and gray colored baton hour markers. Features include a date calendar, small-second, 60-minute and 24-hour registers. The Eco-Drive quartz movement inside is powered by the sun or any other light source and will not require a new battery. Citizen watch is water-resistant to 100 meters. 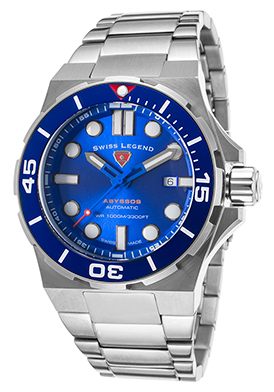 The Swiss Legend Abyssos automatic men’s timepiece is outstanding diver’s watch choice with precison Swiss-made craftsmanship inside and out along with water-resistance to 1,000 meters. The premium-grade stainless steel case is presented on a handsome triple link bracelet in satin-finished stainless steel. The unidirectional rotating bezel with a blue enamel top-ring surrounds the legible blue dial with luminous hands, baton and cabochon dot hour markers. A window at the 3 o’clock hour reveals the automatic date calendar. 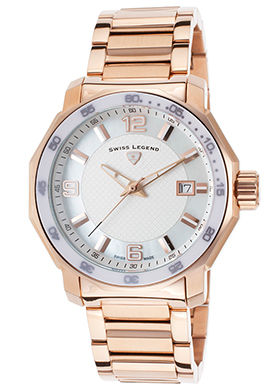 Swiss Legend watch is 46mm in diameter and 19mm thick. Daytona Beach, Florida is easily recognized for the annual Daytona 500 Race, which takes place every February. However, the city is actually more widely popular and visited for the annual Bike Week which takes place starting today and runs through March 12, 2016. Over 500,000 bikers and biking enthusiasts will be participating in the nine-day, which is also the biggest annual biker’s event in the world. Everything from high-flying Supercross racing and ATV Supercross Racing to flat track racing and amateur racing events will be taking place. Considering the costs of many premium motorcycles from Confederate, Vyrus, NCR and Ecosse running from $100,000 to $300,000, biking is very much a high-end luxury activity. And many fashion designers from Ralph Lauren and True Religion to Balmain and Diesel offer jackets, jeans and trousers for motorcycle enthusiasts in their premium collections. Popular watchmakers Bell & Ross, Luminox, Invicta, Swiss Legend, MOMO Design, Mulco, Ritmo Mundo, TAG Heuer, Red Line and Porsche Design understand the importance of having wristwatches with lighter-weight, yet durable silicone, rubber and polycarbonate bands ideal for bikers. You’ll find many biker-inspired timepieces at luxury retailer TheWatchery.com from these watchmakers, many with lighter weight titanium and polycarbonate cases. The Luminox Navy SEAL Colormark 3050 watch, Invicta Subaqua Reserve Chronograph, Swiss Legend Commander Chronograph and Porsche Design Dashboard Chronograph are all excellent watches for bikers. With a durable yet lightweight polycarbonate case and matching multi-link bracelet, the Luminox Navy SEAL Colormark 3050 timepiece is lightweight on the wrist and has luminous hands and hour markers ideal for night riding. Polycarbonate is extremely durable man-made plastic that is used for bullet-proof vests. This 44mm diameter, 14mm Swiss-made watch has a unidirectional rotating bezel and legible black dial. Features include precise quartz movement inside and water-resistance to 200 meters. 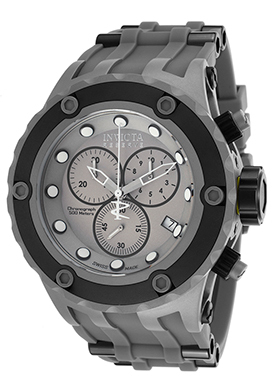 The Invicta Subaqua Reserve Chronograph is another excellent choice with a lightweight 52mm diameter titanium case and grey polyurethane strap. The stationary black bezel encircles the grey dial with three sub-dials, luminous hands and hour markers. 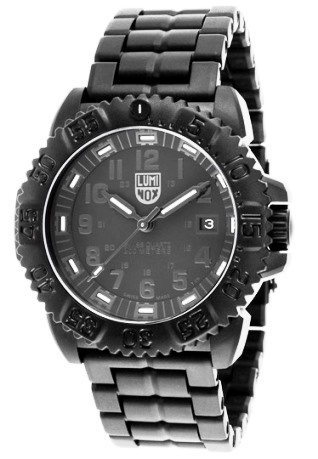 Features include Swiss-made quartz movement inside and water-resistance to 500 meters. 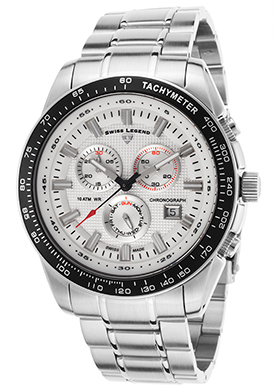 You do not have to look any further than the Swiss Legend Commander chronograph for an excellent, yet affordable biker’s watch. This outstanding men’s chronograph has a 46mm diameter, 15mm thick case in brushed titanium and attractive black silicone strap. The unidirectional rotating bezel surrounds the black dial with three sub-dials, luminous hands and Arabic numeral hour markers. Features include Swiss-made quartz movement and water-resistance to 200 meters. 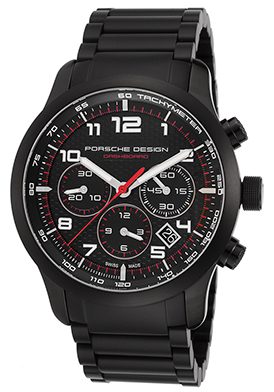 The Porsche Design Dashboard chronograph is sleek and racy in premium-grade titanium. This premium Swiss-made automatic watch has a 42mm diameter case and matching titanium bracelet have a satiny brushed finish. The stationary bezel surrounds the black dial with a tachymeter outer dial, three sub-dials, luminous hands and hour markers. An exhibition skeleton case back lets you see the intricate automatic movement inside. Chronograph is water-resistant to 100 meters or 330 feet. The office place is a constantly changing environment, especially when you consider today’s office interiors and office workers’ apparel. Most workplaces today have evolved into more casual, relaxed environments…from the work-at-home settings many workers now experience to the informal and open cubicle workplaces that shape a good number of today’s offices. It is no wonder office apparel has changed as well. Business suits and blazers, dress shirts and ties, jackets and skirts are no longer the norm for good a number of today’s office workers. The dress-down “Casual Friday” looks of previous time periods have now evolved into being worn the entire week. Khaki pants, dress jeans, polos, sport and button down shirts are now the everyday norm for many office workers. Shoes and accessories have also become more relaxed as well with casual loafers, flats, sandals and sneakers being worn in the workplace. Wristwatches have also taken a more relaxed look in the workplace too with sporty fashion styles taking the place of dressier styles. This week luxury retailer TheWatchery.com focuses on The New Business Casual with their Dress For Success event. Over 80 men’s watches are featured in the week-long promotion, including popular styles from Daniel Wellington, Swiss Legend, Bulova, Lucien Piccard, Invicta, Citizen, Luminox, Michael Kors, TechnoMarine and TW Steel. The Lucien Piccard 90th Anniversary timepiece, Daniel Wellington Classic Sheffield watch, Invicta I-Force and Swiss Legend Pioneer chronographs are all excellent business casual watch choices. 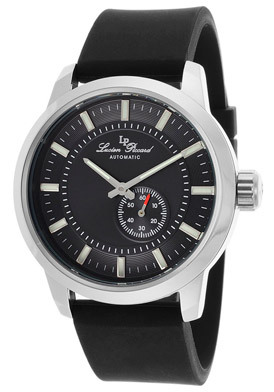 The Lucien Piccard 90th Anniversary automatic timepiece for men features the precision excellence the brand is renowned for along with a streamlined contemporary lines ideal for every workplace. 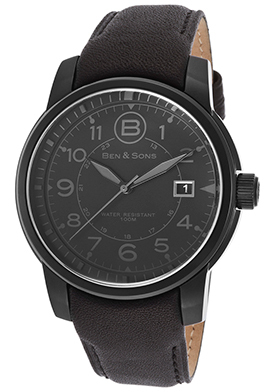 The 44mm diameter case in stainless steel is presented on a sleek black silicone strap. The attractive black dial has a small-second sub-dial, luminous hands and hour markers. 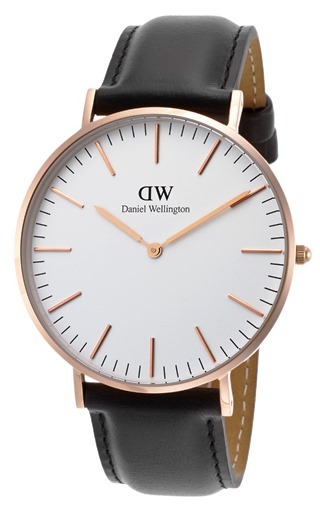 With a rose gold-tone stainless steel case that measures 41mm diameter and 7mm thick, The Daniel Wellington Classic Sheffield men’s watch fits perfectly in any workplace environment with a handsome black leather strap and attractive white dial with rose gold-tone baton hands and hour markers. 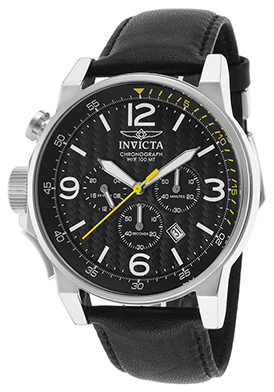 The Invicta I-Force men’s chronograph is sure to make an impression in the office with a 46mm diameter case in stainless steel and pebble textured black leather strap. The fluted crown and push-piece on the left facing side of the case add distinction. The textured black dial features three subdials, a date calendar, luminous sword hands and hour markers. 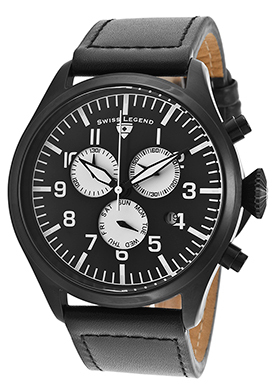 The Swiss Legend Pioneer chronograph is designed for today’s well-dressed man in workplace. The 47mm diameter case in black-ion plated steel is presented on a supple black leather strap with distinctive stitched detail. The black dial features three white sub-dials, luminous sword hands and Arabic numeral hour markers. The Daniel Wellington, Invicta and Swiss Legend men’s watches each feature quality quartz movement inside for time-keeping accuracy. Complimentary delivery and returns are included on all domestic purchases within the continental United States at The Watchery.com. Swiss-made is a term easily recognized on a watch dial. It is also associated with a good number of prestigious watch brands from Rolex, Chopard and Baume & Mercier to TAG Heuer, Raymond Weil and Maurice Lacroix. Only timepieces made in Switzerland…from the intricate movement inside the case to the exterior craftsmanship of the case along with the assembly of the bezel, crystal, bracelet and strap…can be deemed as a Swiss-made watch. Prominent international watchmaker Swiss Legend is currently in the process of transitioning itself as a Swiss-made watch brand. The recent introduction of the brand’s new Atari, Altitude and Meridian Swiss-made collections now qualify Swiss Legend as a Swiss-made watchmaker. The three new collections, the Atari for women along with the Altitude and Meridian for men feature expert Swiss precision craftsmanship inside and out. Hence, Swiss-made timepieces are now part of Swiss Legend’s DNA. The new series are showcased in the Swiss Legend Semi-Annual Sale taking place this week luxury retailer TheWatchery.com. 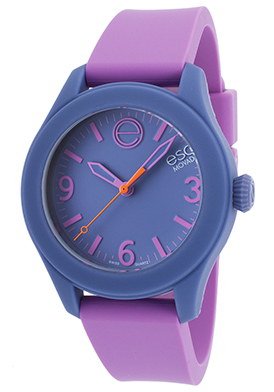 Over five hundred popular men’s and women’s watch styles are featured in the promotion. With Valentine’s Day just around the corner, the Swiss Legend Altitude chronograph is an excellent choice for the special man in your life. 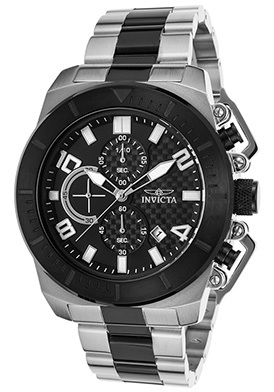 This dynamic men’s timepiece features a premium grade stainless steel case with brushed and polished surfaces. The triple-link bracelet in satin-finished steel features polished steel accent links for striking contrast. The black enamel finished tachymeter bezel with screened markers encircles the textured silver-colored dial with three subdials, luminous hands and hour markers. A window at the 4 o’clock hour reveals the automatic date calendar. Features include a small-second, 60-minute and day-of-the-week register. A screw-down crown and caseback provide water-resistance to 100 meters or 330 feet. 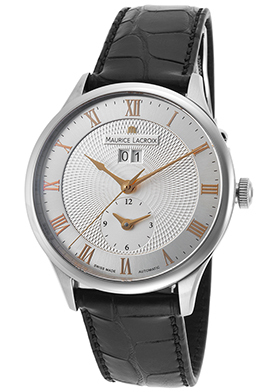 Quality Swiss quartz movement inside assures you of precise time-keeping accuracy. Chronograph is 43mm in diameter and 12mm thick. Complementary shipping and returns are included on all domestic US watch purchases at TheWatchery.com. All eyes in the art world are on Miami Beach, FL this year as the 13th Annual Art Basel Week takes place in the Southeast resort. Over 75,000 individuals from all around the globe are expected to be attending various art exhibits, displays and festivities this week at the modern art celebration. Miami is one of only three locations that holds Art Basel events in the entire world. Hong Kong and Basel Switzerland are the two others. The event, traditionally held in early December, gives visitors a warm winter vacation retreat in the hot tropical climate of South Beach. Over 260 leading modern and contemporary art galleries participate in the main exhibit, which takes place at the Miami Beach Convention Center, located in South Beach. Additional exhibits, events and displays are held in outlying areas of Miami. Local museums also have events and exhibits in conjunction with Art Basel. Singer Miley Cyrus kicked off the entertainment for the week, performing at a private concert at the Raleigh Hotel in South Beach. Film stars Leonardo DiCaprio, Emily Blunt and Kate Hudson were seen taking in the exhibits and displays. 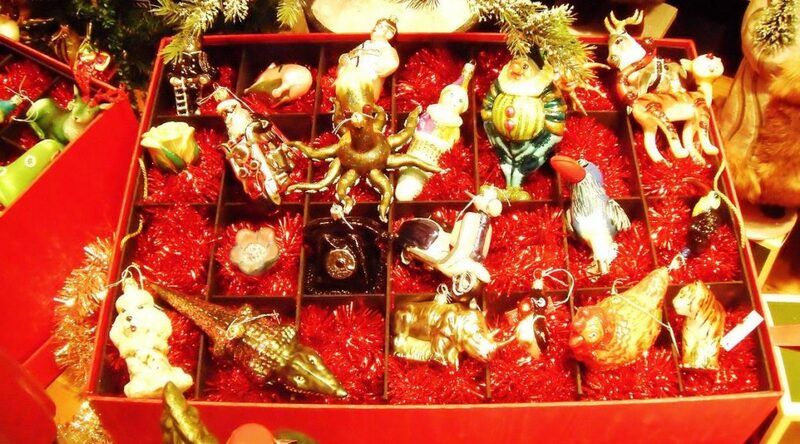 Prominent watchmaker Swiss Legend is also participating in promotional events in Miami during Art Basel this week. The brand’s modern and innovative characteristics certainly capture the essence of the modern art celebration. You’ll find many Swiss Legend watches for men and women at luxury retailer TheWatchery.com, including the highly-regarded Militare No 1 Automatic Chronograph. This virile and masculine men’s timepiece features a ruggedly appointed case in premium-grade black ion-plated stainless steel. The robust, amply proportioned case is an impressive 53mm in diameter and 18mm thick. 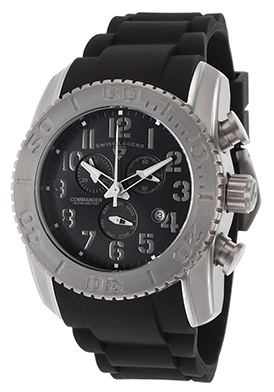 The high-performance black silicone strap with the Swiss Legend name embossed on the sides adds distinction. 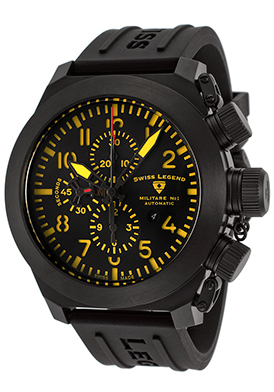 The stationary bezel encircles the legible black dial with three subdials, yellow Superluminova hands and hour markers. A semi-exhibition caseback lets you see the intricate movement inside. Features include an automatic date calendar, small-second, 30-minute and 60-second registers. A locking screw-down crown and push-pieces provide water-resistance to 200 meters or 660 feet. Premium Swiss-made automatic movement inside delivers ultra-precise time-keeping accuracy.